(November 23, Colombo, Sri Lanka Guardian) Mr. Andrew Samaratunga, President of the Sri Lankan Movement for Peace, Justice And Reconciliation leading the delegation representing the Catholic Community of Sri Lanka to the Lessons Learnt and Reconciliation Commission (LLRC) on Monday the 22ND November stated that addressing the long standing grievances of the Tamil Community is a pre-requisite for Reconciliation & also stated that state should not delay anymore, the work towards devolution of power to the periphery. The delegation also comprised of Former Director of Education, Mr.B.C.I.Perera, & M/s Kingsley Karunaratne, Neville De Silva, & Erase Perera, all Central Council Members. Mr. Samaratunga further stated that the main political parties played politics with the Tamil minority in order to come to power and remain in power regardless of concerns and aspirations of the Tamil people. 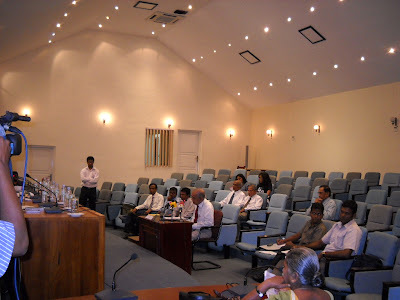 The politicization of public life has been the bane of the political life of Sri Lanka, The dismantling of the independence of the public service by the Bandaranaike regime paved the way for rampatant interference of politicians of every hue to achieve personnel and partisan purposes, at the expense of the public good. Hence immediate steps should be taken to depoliticize the public service and ensure, in particular, the judiciary is independent, free of all political influence. ‘We support the government in addition takes the steps to win the minds and hearts of Tamil people by addressing their concerns regarding justice, rehabilitation(lands, housing ,livelihood),Human rights etc. They are even now, generating strong feelings of anger and resentment’. They need a civil government in the North but not a heavy presence of the military and this will go counter to the objective of wining the confidence of the Tamil people. The military should be deployed only to the extent necessary to maintain law and order’ .He further stated as directed by the Sri Lankan Movement for Justice, Peace and Reconciliation. Mr. B.C.I. Perera stated that we need an education system which caters for the 21st millennium technological aspirations that should be targeted for the present day needs of job market to build up a Sri Lankan identity common to all ethnic groups. This proposed education system should be binded with present day needs but not on political or other mis-concepts. We need to incorporate quality into this system where it should carry Justice, Fair play and Equality on all ethnic and religious groups in new Sri Lanka. When introducing subject courses in History, the state should not incorporate things which will be detrimental to ethnic and religious reconciliation of the country as we done in the recent past. All children of multi ethnic and religious groups should be given a religious education of their own religion inside the school premises compulsorily and when they reaches ordinary level, by using the History subject, they should be given a sound knowledge of universal religions using Thipitaka, Bagawath Geetha,Al-Quran,and Holy Bible. In addition, for the minority religious groups of Catholics/Christians a separate Christian School Unit should be formed to cater for their urgent needs as at present, there are such units for Muslims, Estate Community and Tamils. Finally he requested provision for starting of Tri-lingual Sinhala, Tamil and English education facilities to ensure National Reconciliation which is the present day urgent vital need for future’. Another delegate, Central Committee member of SLMJR, Mr. K. Karunaratne stated, ‘There should be Equal legal rights for everybody without any discrimination in caste, race or religion. Making laws for the benefit of one community ignoring another community is a hindrance for reconciliation. The articles 29(4) and 29(2) of the Soulbury constitution which prohibited discrimination in legislation against any specific community was effective until 1972.This relief ensured protection of the minorities and was later abolished by 1972 constitution. So there is a genuine need for such relief for the minorities. Even if this legislation was on force at that time, the ‘Sinhala only state language act’ passed in Parliament in 1956.National languages (Sinhala and Tamil) should be given an equal status and preferences should not be given to any language. Also the resettlement of Sinhalese, Muslim and others who were evicted from north and east should be done parallel to the process of resettlement, concerning their rights and protection. E.g. 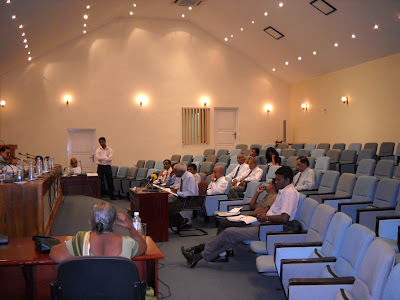 Fisheries community of Kalkuda in Batticaloa district, Seelawatura in Mannar district, and Kalarawa in trincomalee district and Madhu Road Sinhala people. State appointments and promotions including three armed services and police, and all other state institutions should be given according to the ethnic and religious ratios of the country. Then only we can realize that genuine effort is making by the state to build up a Sri Lankan identity common to all ethnic groups’. He finally stated that,’ The devolution of power to the provinces and to local authorities should be considered in order to empower the people who live in the outstations and to make them participants in development of their own areas.